The 24 Hours of Le Mans was won in 1980 by a Rondeau GTP car powered by a mildly modified Ford Cosworth DFV engine. Encouraged by this success, Ford decided to develop a bespoke GTP car built around the four-litre, endurance Cosworth DFL engine. Tasked with designing the new Ford C100 was Len Bailey, whose previous work included the Le Mans winning GT40 and the subsequent F3L. Bailey designed an aluminium monocoque chassis that used the Ford Cosworth engine and Hewland gearbox as fully stressed member. The rear suspension featured rocker operated, in-board springs and dampers. These were fitted to make room for massive ground-effect tunnels. The C100 bodywork had a blunt nose with round headlights and a long tail with the wing mounted just behind the lead edge of the bodywork. Ford had intended the C100 to make its debut at the 24 Hours of Le Mans in June of 1981 but the program was considerably delayed. Eventually, some three months behind schedule, the C100 first appeared on track for the Brands 1000km. 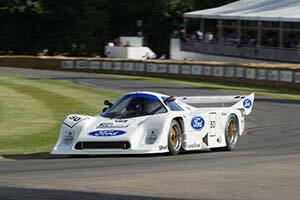 Tapped to drive the Ford of Cologne built machine were Manfred Winkelhock and Klaus Ludwig. The C100 qualified on pole with a 1.1 second margin but was forced to retire with gearbox failure after just 40 laps. Ahead of the 1982 season a Mk2 version of the C100 was developed but without the help of Bailey, who had already left the project. Significantly, the four cars built for 1982 featured a much strong honeycomb aluminium monocoque built by John Thompson. The bodywork was also extensively modified. The nose was now much sharper and square lights were fitted. The shorter rear end featured a taller wing. The intakes for radiators were moved from the top of the bodywork to the sides.